Paroxysmal nocturnal hemoglobinuria (PNH) is a rare acquired, life-threatening disease of the blood. The disease is characterized by destruction of red blood cells by the complement system, a part of the body’s innate immune system (hemolytic anemia), blood clots (thrombosis), and impaired bone marrow function (not making enough of the three blood components). 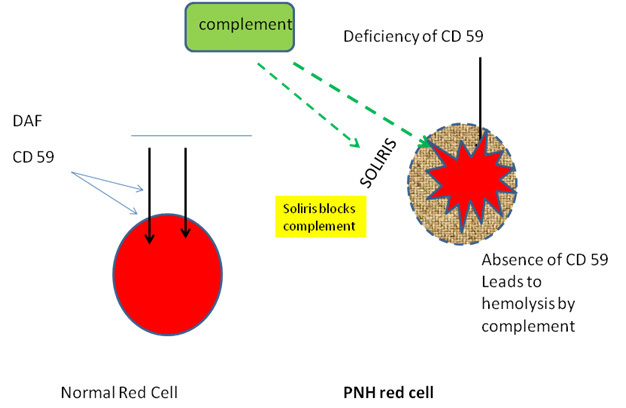 PNH is the only hemolytic anemia caused by an acquired (rather than inherited) intrinsic defect in the cell membrane (deficiency of glycophosphatidylinositol leading to the absence of protective proteins on the membrane). PNH affects 1-1.5 persons per million of the population and is primarily a disease of younger adults. The median age of diagnosis is 35-40 years of age, with occasional cases diagnosed in childhood or adolescence. PNH is closely related to aplastic anemia. In fact, up to 30% of newly diagnosed cases of PNH evolve from aplastic anemia. Similarly, the risk of developing PNH after treatment for aplastic anemia with immunosuppressive therapy (anti-thymocyte globulin and cyclosporine) is approximately 20-30%. The median survival after diagnosis is 10 years; however, some patients can survive for decades with only minor symptoms. PNH occurs when mutations of a gene called PIG-A occur in a bone marrow stem cell. Stem cells give rise to all the mature blood elements including red blood cells, which carry oxygen to our tissues; white blood cells, which fight infection; and platelets, which are involved in forming blood clots. In PNH, the affected stem cell passes the PIG-A mutation to all cells derived from the abnormal stem cell. Cells harboring PIG-A mutations are deficient in a class of proteins called GPI-anchored proteins. Certain GPI-anchored proteins protect red blood cells from destruction, some are involved in blood clotting, and others are involved in fighting infection. The majority of PNH-related issues, including the destruction of red blood cells (hemolytic anemia), blood clots (thrombosis), and infection, result from a deficiency of these proteins. The genetic defect responsible for causing PNH has been identified. The gene responsible for PNH is carried on X-chromosome and both males and females may be affected. The red cell membranes are abnormally sensitive to complement. Mild anemia of gradual onset with fatigue or weakness. Recurring infections and/or flu-like symptoms. Bleeding problems and easy bruising may occur. Abdominal pain crises and back pain. The classic symptom of bright red blood in the urine (hemoglobinuria) occurs in 50% or less of patients. Frequently patients notice their urine is the color of dark tea. Typically, hemoglobinuria will be most noticeable in the morning, and clear as the day progresses. Attacks of hemoglobinuria may be brought on by infections, alcohol, exercise, stress or certain medications. Many patients note a feeling of fatigue that may be disabling during periods of hemoglobinuria. The excessive fatigue does not appear to be related to the degree of anemia, as it improves when the hemoglobinuria abates. 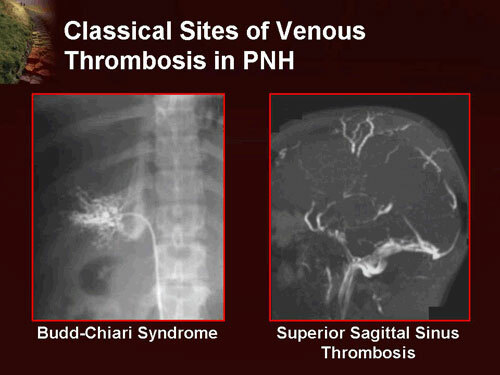 Thromboses occur almost exclusively in veins, as opposed to arteries, and are the leading cause of death in PNH. These are often at unusual sites, e.g. the hepatic vein (causing Budd-Chiari syndrome), the portal vein of the liver (causing portal vein thrombosis), the superior or inferior mesenteric vein (causing mesenteric ischemia) and veins of the skin. Cerebral venous thrombosis, e.g. sagittal sinus thrombosis, is more common in patients with PNH. Aplastic anemia. This may follow classical PNH; in other cases, it is the first manifestation of PNH. Classical PNH: Evidence of PNH in the absence of another bone marrow disorder. PNH in the setting of another specified bone marrow disorder such as aplastic anemia and myelodysplastic syndrome (MDS). Subclinical PNH: in which patients have small PNH clones on flow cytometry but no clinical or laboratory evidence of hemolysis or thrombosis. Today, the gold standard is flow cytometry for CD55 and CD59 on white and red blood cells. Based on the levels of these cell proteins, erythrocytes may be classified as type I, II, or III PNH cells. Type I cells have normal levels of CD55 and CD59; type II have reduced levels; and type III have absent levels. There is usually anemia and often neutropenia and thrombocytopenia. Iron deficiency is common (read more). Hemoglobin and hemosiderin may be found in the urine. The neutrophil alkaline phosphatase (NAP) score is low (as in CML). There is increased sensitivity of the red cells to lysis in acidified serum (Ham’s test). The appropriate treatment for PNH depends on the severity of symptoms. Some patients will experience few or no symptoms from PNH and do not require treatment other than folic acid and sometimes iron supplementation to increase red blood cell production. Over time, the disease may progress and more aggressive supportive care may be indicated depending on the patients’ symptoms. There is disagreement as to whether steroids (such as prednisolone) can decrease the severity of hemolytic crises. Transfusion therapy may be needed; in addition to correcting significant anemia, this suppresses the production of PNH cells by the bone marrow, and indirectly the severity of the hemolysis. Iron deficiency develops with time, due to losses in urine, and may have to be treated if present. Iron therapy can result in more hemolysis as more PNH cells are produced. PNH is a chronic condition. In patients with only a small clone and few problems, monitoring of the flow cytometry every six months gives information on the severity and risk of potential complications. Given the high risk of thrombosis in PNH, preventive treatment with warfarin decreases the risk of thrombosis in those with a large clone (50% of white blood cells type III). Episodes of thrombosis are treated as they would in other patients, but, given that PNH is a persisting underlying cause, it is likely that treatment with warfarin or similar drugs needs to be continued long-term after an episode of thrombosis. N.B. heparin can exacerbate the thrombotic problem, possibly by activating complement. This can be prevented using inhibitors of the cyclooxygenase system, such as aspirin, ibuprofen, and sulfinpyrazone. Medications that increase the risk for thrombosis, such as oral contraceptive pills, should be avoided. Occasionally patients will respond to anti-thymocyte globulin (ATG), but frequently they will continue to require red cell and/or platelet transfusions. The anticomplement agent Eculizumab is a humanized monoclonal antibody against terminal protein C5; it has been shown to be highly effective in reducing intravascular hemolysis. Eculizumab is given intravenously (IV) at a dose of 900 mg over 30 minutes every 2 weeks. Eculizumab improves the quality of life and decreases the need for blood transfusions but does not appear to affect the risk of death. It does not appear to change the risk of blood clots, myelodysplastic syndrome, AML, or aplastic anemia. Eculizumab (Soliris) is the only drug approved by the U.S. Food and Drug Administration (FDA) and the European Medicines Evaluation Agency (EMEA) to treat PNH. Eculizumab is among the most expensive pharmaceuticals in the world! Allogeneic (from a donor) bone marrow transplantation (BMT) is the only cure for PNH. BMT replaces all of a patient’s bone marrow stem cells with those from a donor, usually a healthy brother or sister. It may be appropriate for patients who do not respond to eculizumab or for those who have severe reductions in red blood cells, white blood cells, and platelets. The allogeneic BMT approach is best reserved for young patients with very severe disease in whom the marrow failure component is most significant. Diagnosis and management of paroxysmal nocturnal hemoglobinuria. Blood. 106 (12): 3699–709. Parker, Charles (2012). “Paroxysmal nocturnal hemoglobinuria”. Curr Opin Hematol. 19: 141–148. 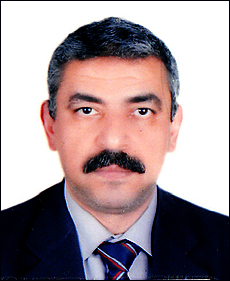 Luzzatto, L. (15 August 2013). “PNH from mutations of another PIG gene”. Blood. 122 (7): 1099–1100. Martí-Carvajal, AJ; Anand, V; Cardona, AF; Solà, I (30 October 2014). “Eculizumab for treating patients with paroxysmal nocturnal hemoglobinuria.”. Paroxysmal Nocturnal Hemoglobinuria (PNH) is characterized by hemolytic anemia, bone marrow failure and a tendency toward the development of thrombosis.